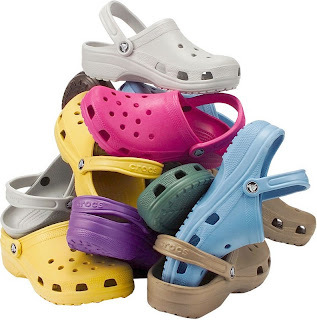 A few summers ago I was introduced to these wonderful shoes called crocs. Have you heard about them? If not, you must run out to the nearest store or jump on their website and order yourself a pair...you will NEVER want to wear another kind of shoe (well besides flip flops). I own a few pairs in tan and black. The black ones are the kind that don't have the holes so I wear the to work almost every day. In fact, I love them so much, I even wore them in winter with socks, unless it was icy. 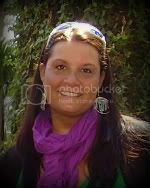 Then I only wore boots because I had no shot of walking up my hill in them. In fact my boots are the only shoes with backs that I wear. I apparently wear an odd size a 10 W and after trying on all kinds of hard soled, non-cushy, uncomfortable shoes...another pair of crocs is sounding better and better. 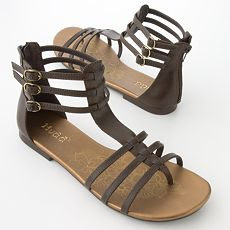 I actually bought a pair of sandals, but I'm just not feeling them. *SIGH* I guess I'll keep looking and hope that HR changes the policy so that flip flops fall into the appropriate work footwear category. In the meantime, I'll be wearing flip flops and running around barefoot. What's your perfect summer sandal? 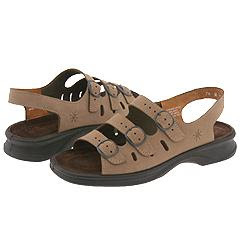 I'm laughing out loud at your grandma sandals. Not only because of the way they look, but they DO look comfy. Since I broke my toe last year, I no longer wear flip flops because that is how I broke my toe. I MISS THEM, but too scared to wear them again. I too am looking for the perfect summer shoe too. I'm thinking open toed ballet flat...in YELLOW!! I can't find them:( My mom LOVES being barefoot too. I'm always wearing socks or slippers. I'm a wierdo. I love flip-flops!! They are my FAVE! 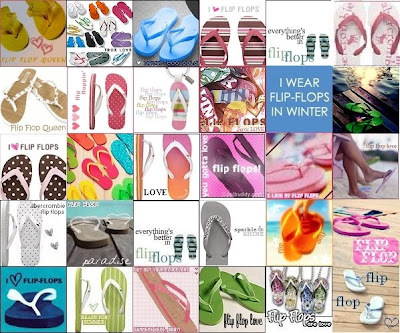 Do you own any yellow-box flip-flops? You must look them up b/c they are so comfortable & cute too!